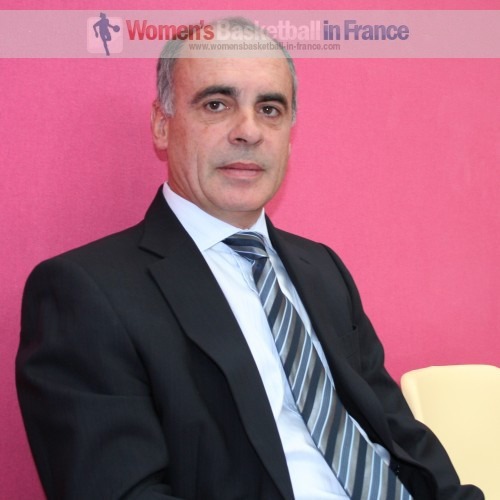 Laurent Buffard (in picture) won the Coupe de France as coach of USVO five times and will not be able to add a sixth crown this season. Bourges Basket got past Nantes-Rezé (67-58) in an evenly contested match. The first 10 minutes turned into a shoot-out with Bourges coming out on top (27-21) with 7 points by from Greek international Styliani Kaltsidou. Lindsey Taylor was giving Bourges a hard time while hitting all her shots for 7 first-quarter points. The scoring stopped during the second quarter as Pierre Vincent (right) and Buffard turned the basketball game into a game of chess. Bourges focused on stopping Taylor from shooting and frustrating her into picking up 3 fouls. However they forgot about Allison Hightower. Nantes trailed (30-31) with four minutes remaining in the second quarter. Bourges had to step up a gear and won crucial duals that enabled them to head into the locker room leading (39-34). The third quarter turned into a turnover festival with both teams playing well defensively. Caroline Aubert's trey from down-town for Nantes-Rezé to close the scoring in the third quarter (48-50) upset Vincent. Bourges kept Nantes-Rezé scoreless for almost four minutes in the final quarter while scoring 7 points (57-48). Then Taylor returned to action for Nantes and continued her perfect shooting day with 4 points. Hightower quickly added 2 more points to bring down the deficit to 3 points. Taylor was a little hyped up and picked up 2 quick fouls against Emméline Ndongue. Her game was over with four minutes left to play. With Taylor out of the way Ndongue was free for Bourges. She hit back to back scores and her side was back in charge to cruise to victory. For Bourges Kaltsidou led the scoring with 18 points while Ndongue 13 and Miyem were the only other players in double digits with 13 and 10 points apiece. For Nantes Hightower had 12 points followed by Taylor and Emilija with 11 points each.